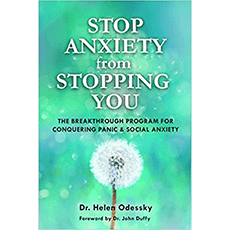 Licensed clinical psychologist and anxiety expert Helen Odessky introduces her breakthrough program for putting an end to panic and social anxiety. It provides an understanding of social anxiety, anxiety disorder, panic attacks, and how to attend to your emotions by first recognizing the signs of anxiety. The author utilizes her 15 years of experience to guide you through the process of learning how to overcome anxiety and panic attacks for a fulfilling life. XVIII. Are You All In?